​Key Features: Beautiful iconic tree of the Mediterranean; Versatile specimen can be used in a variety of situations. Supplied: In a 3 litre container of peat-free compost, healthy and very well established, approximately 80-100cm (3 feet) high, with full planting and aftercare instructions. 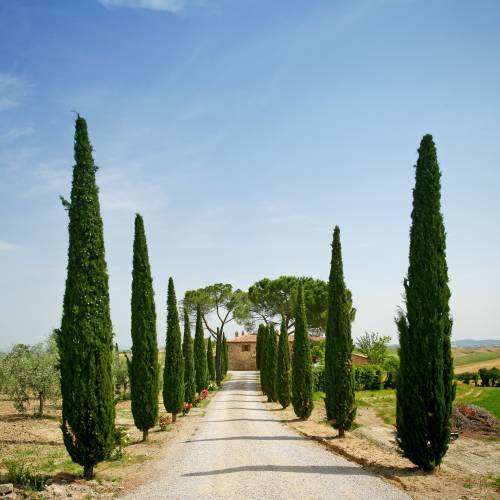 The Italian Cypress is an iconic plant of the Mediterranean region that can transport us to the rolling hills of Tuscany or a sunken villa courtyard surrounded by olive trees and vines. These pencil shaped trees grow tall and upright sometimes exceeding 10 meters in height whilst remaining less than a meter wide. The Italian Cypress is best planted as a young pot grown conifer no larger than six feet at time of planting as larger specimens can be top heavy with under developed root systems and fail to reach their full potential at maturity. Cupressus sempervirens is a versatile tree that can be used in many situations; as large pot plants in courtyards, as avenue plants, to frame a view or simply as a single specimen focal point. If you have the garden for it then this is a must have specimen. On our nursery in the often wet and wild Northern Ireland we grow our Italian Cypress outside all year round without difficulty, providing it with a slightly sheltered sunny spot on free draining soil however, will ensure a thriving architectural beauty that cannot feel to inspire.